At first I was like, “…hmmm…”, then I was like, “huh?”, and finally, “WHAT! ?” Yeah, seriously. Just looking at a screenshot of the game, you’d be forgiven for thinking that Gunpoint is uninteresting – it is anything but. 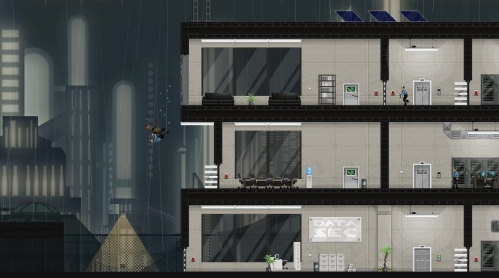 Gunpoint is a 2-D action puzzle game that has you busting into buildings to hack computers. You can jump really high, climb onto walls and ceilings, and even leap out of windows with a security guard beneath you for the would-be deadly fall. It sounds similar to Syndicate, but there’s quite a difference here. For one thing, the focus is on avoiding the opposition, and solving puzzles that occur in real time. The other half of the gameplay has you crossing wires for interesting effects such as a guard trying to turn the lights back on; except that the lights and door switch are switched, meaning that when the guard tries to turn on the lights, he’ll actually be opening the door, which then knocks him out (I have a feeling this kind of thing will never get old). There are all kinds of complicated wire-crossing scenarios to be found in the 8-minute video below. The developer of Gunpoint is still unsure of whether or not the game will be sold, or given away for free. I think he should at least sell it for $1, if only to support him and his small team in the future. For more information, check out the Gunpoint site. The game is scheduled for a PC release sometime in the future.